LANCASTER, Pa. -- NORAD says a runaway unmanned Defense Department balloon that was flying over the skies of Pennsylvania is now down on the ground. Sources tell Action News the balloon is in two pieces - the tail section and the a second larger section- in Montour County. State police are in the area of Yeagle Road and Muncy Exchange Road in Anthony Township and have the area closed off awaiting defense department officials. 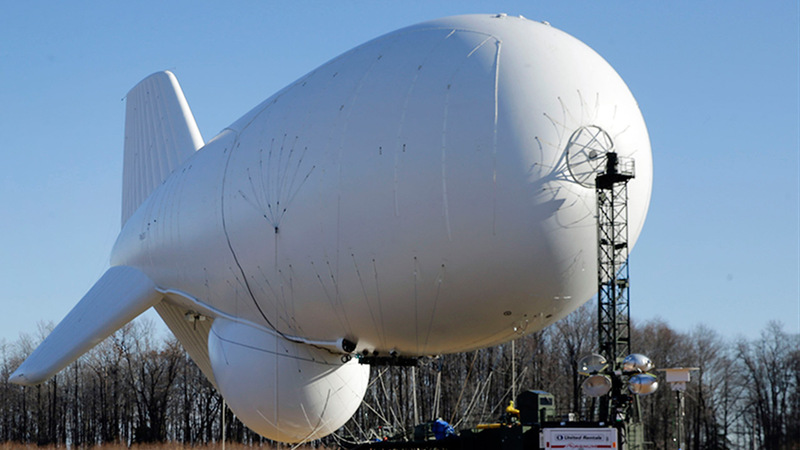 NORAD said at 12:20 p.m. Wednesday the balloon known as a Joint Land Attack Cruise Missile Defense Elevated Netted Sensor System (JLENS), broke free from its mooring station in Aberdeen, Maryland. The balloon traveled through Lancaster and Lebanon counties and then into Columbia and Montour. Earlier, a Twitter user, who captured video of the balloon, had said it landed in Bloomsburg, Pa.
Two F-16 Fighter jets from Atlantic City Air National Guard Base were monitoring the balloon. PPL Electric Utilities reports the tether attached to the aircraft caused widespread power outages across Pennsylvania. PPL reports that the damage appears most extensive in Columbia and Schuylkill counties. There were approximately 30,000 residents without power at the peak of outages and approximately 15,000 remain without power.